The St. Paul bears an inscription in Latin from Acts 9:4, on the arrow emanating from Christ's mouth, which reads: "Saule Saule, quid me persequeris?" (Saul Saul, why are you persecuting me?). 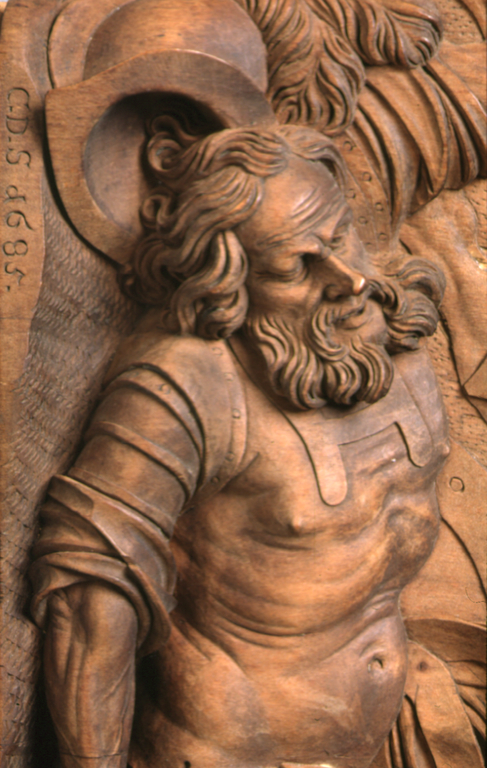 Having just fallen off his rearing horse, Saint Paul lies prostrate on the ground. 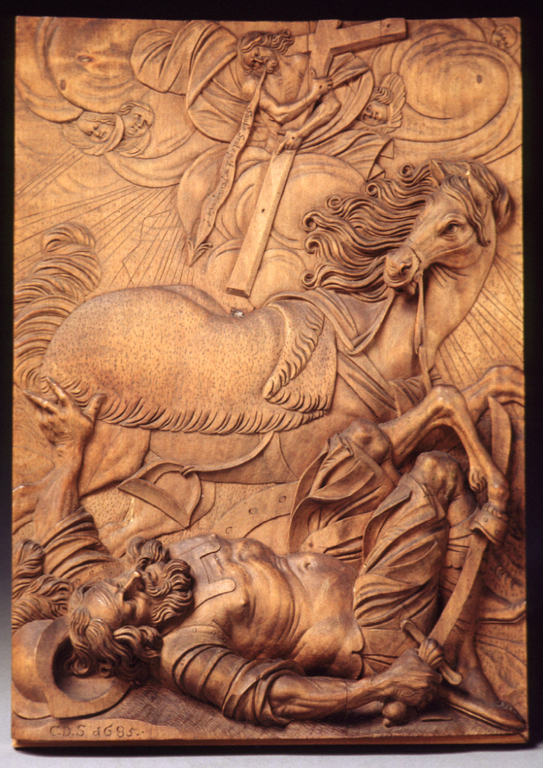 His closed eyes hint at the blindness that struck him the moment that Jesus appeared in the clouds to him. From Jesus's mouth flow the words recorded in the Acts of the Apostles: Saule Saule, quid me persequeris? (Saul Saul, why are you persecuting me)? 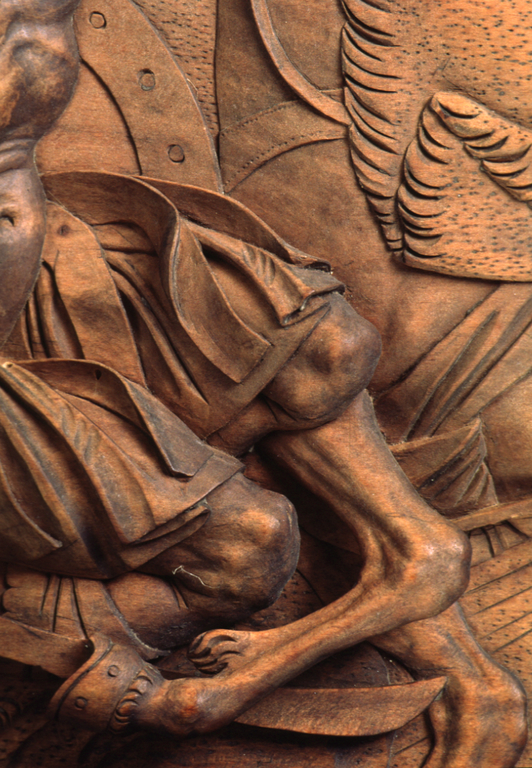 The artist emphasized the drama and emotion of the moment by undercutting the horse's head and front leg and by carving Paul with foreshortening and in the greatest depth to suggest projection into the viewer's space. Saint Paul, originally Saul, was a Pharisee who persecuted Jesus's followers until the episode depicted here. The fall, during which Jesus called upon him to take up an apostolic mission, led to his conversion and a change of name from Saul to Paul. 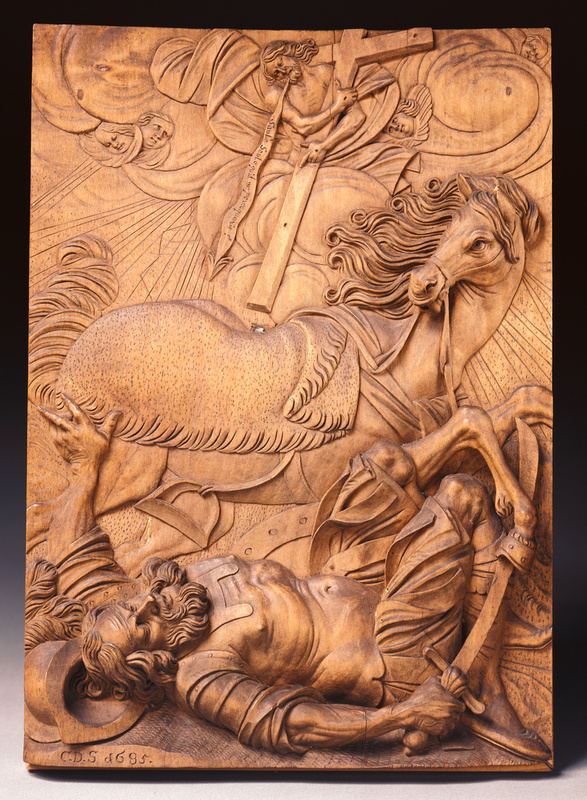 The limewood panel depicting this pivotal moment in Saint Paul's spiritual life is paired with a panel of the Penitent Saint Peter. Together the two served as meditational images, perhaps intended for a Kunstkammer, or collector's cabinet. Alternatively, since sculptor Christoph Daniel Schenck often worked for monastic patrons, the pair may have been housed in a monastery. Same Art Ltd., sold to the J. Paul Getty Museum, 1996. Lohse,Brigitte. "Nachträge zum Werk von Christoph Daniel Schenck." Das Münster 21 (1968), pp. 123-25, fig. 13. Fischer, Fritz, et al. Christoph Daniel Schenck, 1633-1691, exh. cat. (Konstanz: Rosgartenmuseum, with Jan Thorbecke Verlag, 1996), pp. 163-64, no. 36, fig. 36b, pl. 13, entry by Fritz Fischer. Gribbon, Deborah. "Selected Acquisitions Made by the J. Paul Getty Museum, 1995-97." Burlington Magazine 139, no. 1136 (November 1997), p. 823, no. 6, ill.
Fusco, Peter. Summary Catalogue of European Sculpture in the J. Paul Getty Museum (Los Angeles: J. Paul Getty Museum, 1997), p. 47, ill.
Fusco, Peter, Peggy Anne Fogelman, and Marietta Cambareri. Masterpieces of the J. Paul Getty Museum: European Sculpture (Los Angeles: J. Paul Getty Museum, 1998), pp. 74, under no. 24, ill.
Fischer, Fritz. "Zwei Hauptwerke von Christoph Daniel Schenk im J. Paul Getty Museum, Malibu." 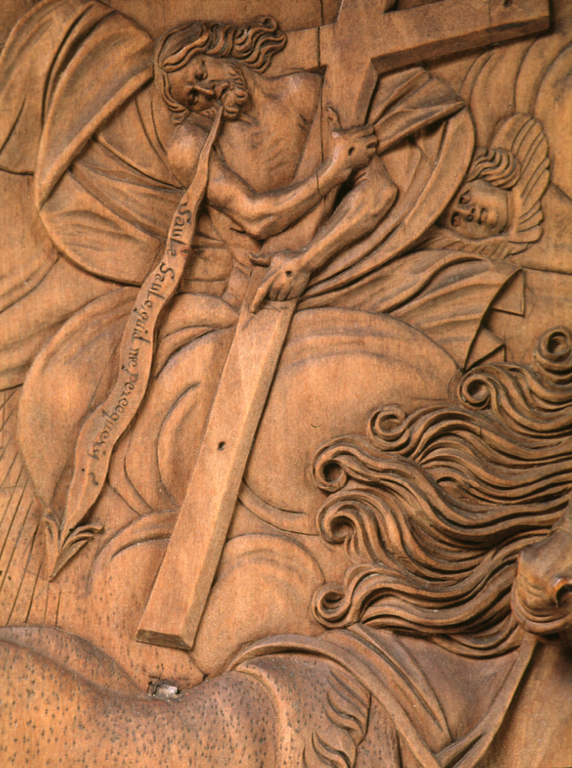 In Skulptur in Süddeutschland 1400-1770: Festschrift für Alfred Schädler. Rainer Kahsnitz and Peter Volk, eds. (Munich: Deutscher Kunstverlag, 1998), pp. 273-80, fig. 1.